When it comes to Fall decorating I like to be a little on the frugal side. I don’t see the point in spending a lot of dough on decorations that are going to be out for only a few weeks. This is why the Dollar Store is my best friend. If you walk the aisles of your local Dollar Store with an open mind you’d be amazed at some of the treasures you can find. With a little creativity and some DIY spirit you can turn a lot of your dollar purchases into terrific home décor. I happen to be perusing my local store a few weeks ago when I spotted these packs of Halloween silhouette cutouts. I thought it’d be cute if I framed the silhouettes in a small wall gallery we have in one of our home’s hallways. This turned out to be a really simple project! I decided to use newspaper as the background for my silhouettes so I just removed the old pics from the frames and used them as a template to measure and cut my pieces of paper. Then I took a glue stick and adhered the cutouts to the newspaper and placed them all back in their frames. I wanted something a little different for the 8 x 10 frame so I traced and cut out the word “Fall” from some black cardstock. I have to say though the owls are definately my fave! I know I'm kind of late to the owl bandwagon but I'm really digging them lately. See, easy-peasy! The best part was seeing how long it took the hubby to notice the change. I mean he only walks through this main hallway a hundred times a day. He didn’t say anything till day seven but of course he “claims” he noticed it earlier in the week but didn’t say anything. Sure, honey. The wall looks GREAT! I love how you waited to see if your husband noticed! LOL! holy cow, this is awesome!!! 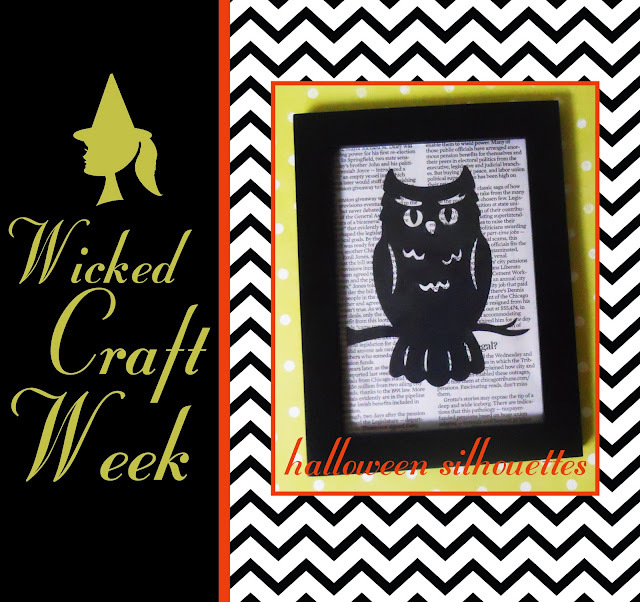 Have you submitted to Dollar Store Crafts?? Of course this is another amazing DIY Craft! Love it. I still think it's so funny your hubby didn't notice! Those are awesome! I love them! you are so creative jennifer!! i love the use of cut-outs and the halloween ones are perfect without giving too much of a halloween effect, i think the cut-outs are adorable! keep up the creativity i love it! I like that you put newspaper behind them! The silhouettes look great!